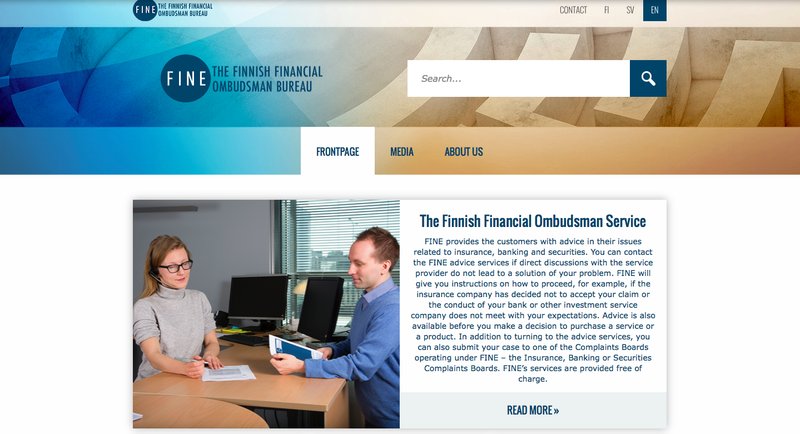 FINE is a Finnish financial sector organisation. The company provides consumers, small enterprises and corresponding customers with advices and solutions for the problems they may face in their insurance, banking and investment operations. FINE seeks to promote the interests of the financial sector’s customers and the healthy development of the practices in the financial sector. The company also contributes to the legislative preparation work. FINE’s services are provided free of charge. The website is one of the most important channels for FINE to reach consumers. Therefore, they wanted to be sure that their website is easy to use and professionally made. FINE researched the usability and visibility of their website from the point of view of consumers and important stakeholders. The research brought out essential information on development targets. As a result, FINE wanted to start a digital makeover for their website. Their goal was to create a user-friendly website which would enable visitors to find the needed information easily and fast. They also wanted to invest in a fresh appearance. Moreover, it was important that the new website would be responsive which allows browsing on smartphones and tablets. Furhermore, the company aimed to digitalize their annual report to a full-online version. The company also wanted to create a digital contact form that would increase the effectivity of their activities. FINE chose Liana Technologies to provide the needed tools. They wanted a partner who has the will and skills to develop the service together. It was also important for FINE to find a partner that already had an ongoing co-operation with advertising agencies. LianaCMS is a versatile and easy to use tool for managing websites. With the help of LianaCMS, FINE was able to give the website a fresh look and build the website responsively. The website was designed together with an advertising agency. What is more, both a digitalized contact form and the first full-online annual report were created to support the new website. The website was build in a way that the visitors can easily navigate and browse throughout the site. Furthermore, the web page analytics that LianaCMS provides on the user interface, makes it easy to monitor the behavior of the visitors and reveal new points for development. Results have been excellent. The website works as planned and it reaches consumers better than before. Navigation is also remarkably easier now. FINE’s digitalized parts, especially the annual report and the contact form, are up-to-date and support the company's brand image of professional and modern services. FINE did a survey asking their stakeholders’ opinions about the new website. As a result, the stakeholders expressed their enthusiasm and satisfaction towards the new website. FINE received positive feedback especially about the appearance of the websites and the mobile scalability. Furthermore, a lot of people are now contacting the company through the newly digitalized contact form, which improves the effectiveness of the company's activities. Got interested? Contact us and ask more about LianaCMS! Contact our experts to hear more. Let us know that you are interested and we will show you how LianaCMS works. LianaCMS is a versatile and modern content management system that combines easy web page management with important analytics. Comprehensive add-ons ensure that it is possible to create either large or small web sites with the desired appearance and features. Request a Demo of our Products.